In 1932 the Westinghouse Bridge was completed over the Turtle Creek Valley between North Versailles and East Pittsburgh. The Lincoln Hwy had descended into the Turtle Creek Valley via Greensburg Pike, ascending toward Pittsburgh on Electric Av in East Pittsburgh. But the steep hills, sharp turns and heavy traffic led to the more direct bypass via what was the longest concrete arch bridge of its time. East Pittsburgh was incorporated in 1895 as a residential community for the Westinghouse manufacturing facilties. The town is geographically divided into two sections: the "Burg" is the one-bustling business district on the valley floor including Electric, Cable, Braddock and Linden avenues. The other section is Bessemer Terrace which occupies the relatively flat hilltop above. Linden Av climbs the hill to link the two parts of the borough, but made for a long walk to work for Westinghouse employees. At the East Pittsburgh end of the Westinghouse Bridge, the Lincoln Highway approach required a cut into the hillside which curves from Electric Av / Ardmore Blvd to the grade of the bridge at the upper end of Linden Av. Construction of the Lincoln Highway cut off the paths over the hillside hindered foot traffic between "The Burg" and Bessemer Terrace. Part of the new highway project included construction of new stairways and two pedestrian tunnels below the Lincoln Hwy. The stairways from Ridge Av on the Terrace (North Braddock) to Oak Av (East Pittsburgh) near the Lincoln Highway have long since crumbled down the hillside. But the tunnel still remains in an isolated -- even dangerous -- part of the highway. There are no sidewalks. The tunnel leads nowhere from a dead ended Oak Av. 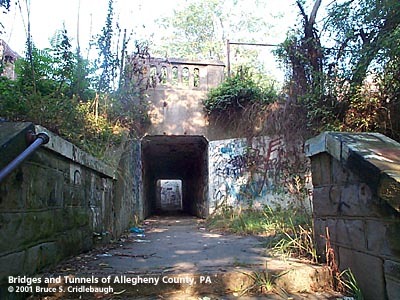 The pedestrian tunnel linking Linden Av and Franklin St is more useable. But with the closing of the Westinghouse plant and the decline of "The Burg" -- which a 1960s redevelopment plan couldn't help and possibly exacerbated -- the Linden Avenue Subway has also fallen prey to trash and vandalism. Signs posted by the local police department warn of penalties for defacing the tunnel and provide the name "Linden Avenue Subway." The lower access from Linden Av to the level of the Lincoln Highway is a WPA-style cut stone stairway. Abuse, disuse and time have taken their toll. The steps are crumbling, but passable. An inset which probably once held a memorial plaque stands empty. Weeds grow over everything. Nearby on Linden Av, the East Pittsburgh Public Works Department equipment shed shares the WPA-style stone construction. It looks like something from a national park, but it too is showing its wear. The parklike setting around the shed is helped by the heavy stone walls, honeysuckle and day lilies...but the effect is hurt by the addition of a more recent red brick garage. The upper stairwell of each of the pedestrian subways have a concrete ballustrade design common to Pennsylvania Department of Highways bridges of the 1930s and 40s. These also have been ravaged by salt and neglect.